Despite the fact that many people come to the town for the pilgrimage, there is a lot of variety for Medjugorje shopping. This spot did not become a popular tourist area until 1981 when the Virgin Mary is reputed to have appeared to six children. Most people come to visit the shrine and apparition sites. The currency in Bosnia and Herzegovina is the Mark, pfening ( 1 KM = 100 pfening ). There are coins and notes, and some places also accept Euro and USD notes ( 1 € = cca. 2 KM ). The main preferred foreign currency is the US dollar. Cash is your best bet, as credit cards are not widely accepted. In Medjugorje, the best form of payment is cash. If you are interested in art then you should stop in at the Two Hearts Art Gallery. 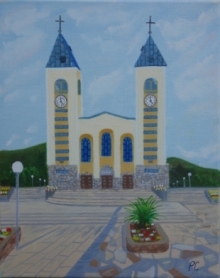 Much of the art is made by locals and art students from the nearby Siroki Brijeg Art Academy. These paintings are very unique to this area, as many focus on the miracles and spirituality of the religious sites. They also offer many unique and special souvenirs besides art. If you need some groceries you can shop at Konzum or Super Nova. Konzum is found next to the post office and they stock a lot of domestic food as well as fresh fruit and vegetables. This is on the town's main square found directly across from St. James Church. Super Nova not only has food but also many household appliances and offers carry out hot meals. This is perfect for backpackers. The traditional crafts special to this country include pottery, leather goods, stone carvings, religious art and metal workings. There are many leather objects that are still made using ancient techniques, particularly shoes. You can find Ali Babas cloth slippers, or Mehmed, very tough traditional shoes. Leather is also used for saddles and bags. The woolen socks are quite famous and they use many floral and geometric patterns. Each type of pattern sock has its own name. Floral embroidery is also common, as young girls embroidered for their trousseau in the past and some Muslim traditions include beautifully embroidered linen. Many goods embroidered with metallic threads can be purchased. Ceramic art goes back many years and potters still produce thick walled containers. These containers are found all through Eastern Europe and many have been uncovered in archaeological digs. Painted pottery is also traditional. These colorful earthenware pots are used for cooking. Many potters still use the traditional and cultural methods of pottery that date back hundreds of years.